"Really true excellent location, subway is front and back doo..."
"Good location, very happy to our trip"
"Room was spacious for the price paid." "I love the comfortable bed in GLAD MAPO." GLAD MAPO, located in the Mapo area, is a popular choice for travelers. From here, guests can make the most of all that the lively city has to offer. With its convenient location, the property offers easy access to the city's must-see destinations. 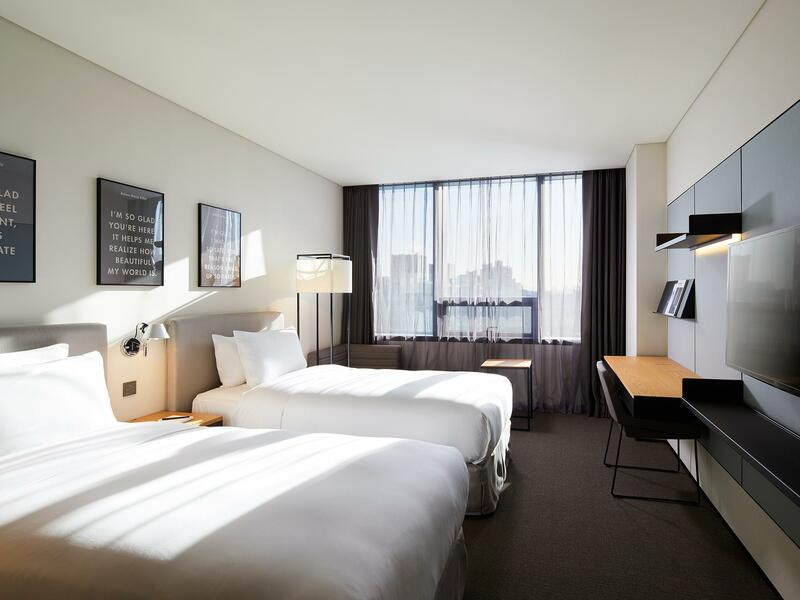 GLAD MAPO offers many facilities to enrich your stay in Seoul. While lodging at this wonderful property, guests can enjoy free Wi-Fi in all rooms, convenience store, daily housekeeping, postal service, wheelchair accessible. 378 rooms spread over 14 floors provide a warm and pleasant home away from home. Comforts such as complimentary tea, closet, towels, carpeting, clothes rack can be found in selected rooms. The property's host of recreational offerings ensures you have plenty to do during your stay. With an ideal location and facilities to match, GLAD MAPO hits the spot in many ways. Children 3-13 years old will be charged a children's rate for breakfast. This is my second time staying at Glad Mapo. It’s conveniently located right outside the subway station (the one that links to the airport). 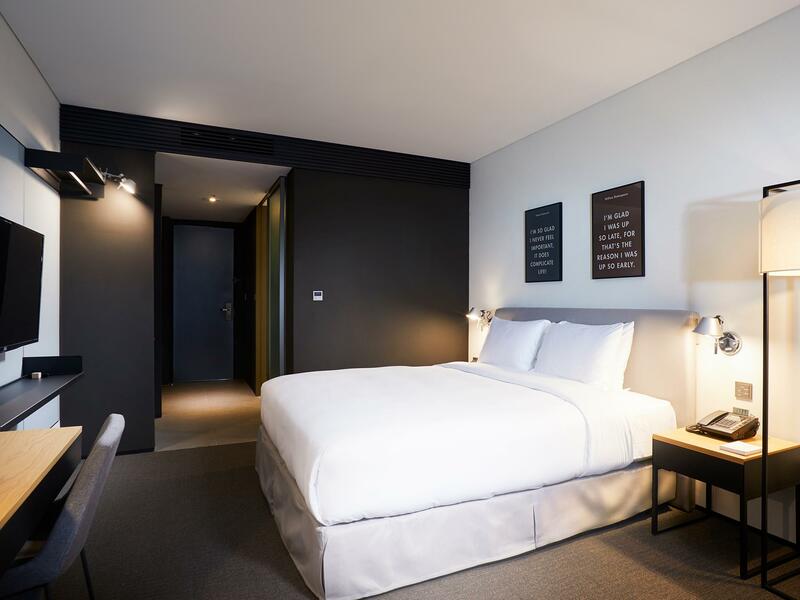 It’s a beautiful hotel, crisp linens, comfy beds and very clean. A great option in Seoul! The price of this hotel room is cheap. So I don't have much expectation. But the bed and the gym room is quite nice. I was satisfied. The location is very good. Just infront of the Gongdeok station which just 2 station from Seoul station. It also one of the station to Airport direct. The room is reasonable big. The room is very clean and provide toilette. Have complimentary hot and water bottles drink. The front desk service staff are very helpful and friendly. There is a convenient store at the lobby. Around the vicinity there is a big supermarket and many nice & good eatery. Will sure choose back this hotel for my next visit. Location is the spot light of this hotel, you can enter hotel less than 15 steps after left the station. 1 bed room suite is very spacious and suitable for family travel with baby. You can sit in the living room when your baby slept. The only cons: there is no kitchen. breakfast never change, we give up the breakfast after we ate the same 3 days. The hotel is right at GongDok station exit, though relatively longer way from the train, it's all indoor. 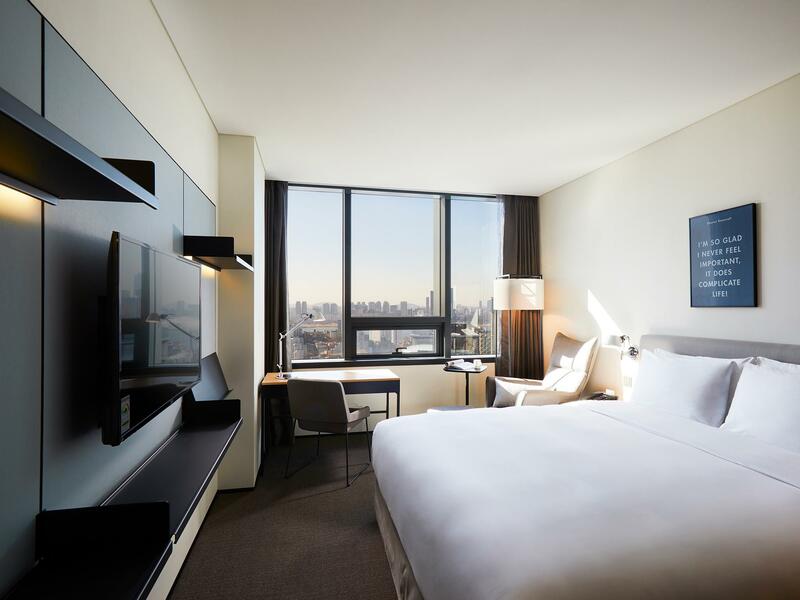 I have been to Seoul several times so it's good for me to try hotels outside myeongdong/dongdaemun. 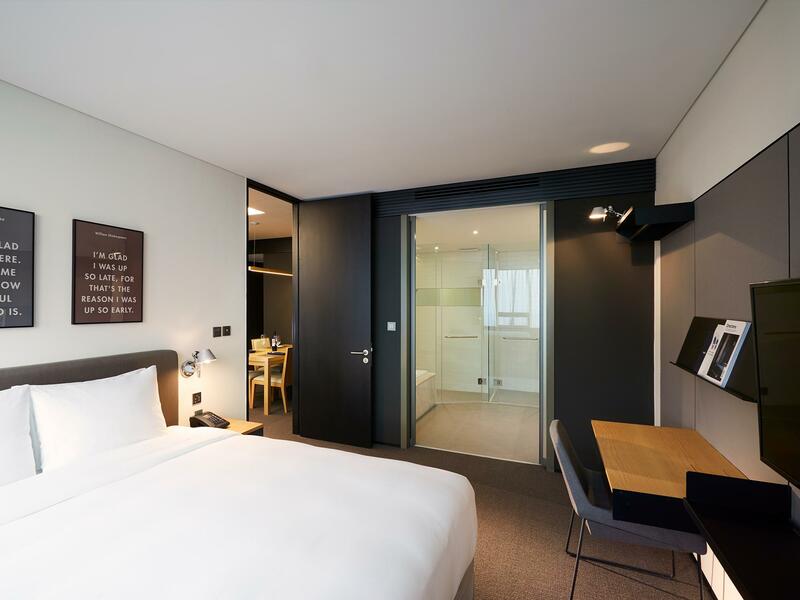 Rooms sizes in myeongdong hotels are usually smaller for the same price. GongDuk is also a connecting station for several subway lines so it's convenient for travelers. It is also only one station away from Seoul station, which is a big station that connects many lines to other parts of Korea. The location is very good. 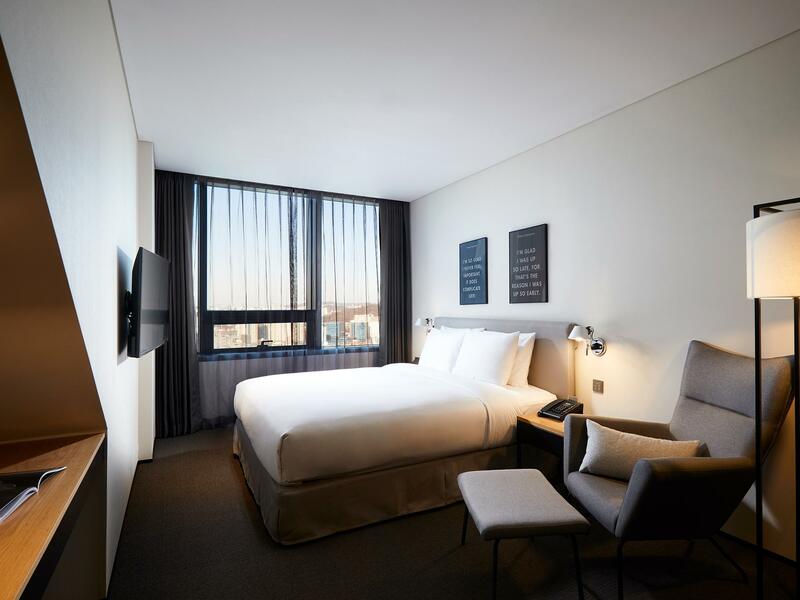 (close to central seoul and just infront of the metro station which is connected to Inchoen airport) Room is also tidy and modern, also the bed was so comfy. The only thing to complain is .......there was no tooth brush and toothpaste. Staff is okay, location is good, very close to the metro station. Room and toilet are clean. Staff was quite responsive to fix the problem when we called them to help on the water leakage in our toilet. To me the most disappointed thing is no bathtub in toilet (I booked the cheapest triple-bed room), other than this, my overall comment to this hotel is fine. travelling by myself and booked a Deluxe Double - room was spacious, very clean and friendly staff. The subway station is in front of the hotel - 5 mins walk to supermarket and many restaurants nearby. I will come back again, definitely. I had a wonderful stay here. The staff were all very courteous and helpful. Highly recommended!!! Pros: Building looks new, friendly staffs who speaks fluent english, upgraded our room to a bigger one, room is clean, amenities in the room are well equipped, comfortable bed, big tv... Cons: Room is kinda small Overall we enjoyed our stay very much. Will definately come back again! Best hotel I have stayed in while I was in Seoul. Literally a short walk to Gongdeok station. Staff were amazing and so helpful, room was spacious and clean. It did have a weird smell on the first day, I believe this may be due to lack of use. Convenience store in the facility. It was one of the best experiences with a hotel I have had since. I really loved the staff. My husbund and I found this hotel to be very pleasent place to stay. Welcoming and professional staffs from the reception desk, specially Elana from the reception helped us to have a better room, so we were very thankful for her genuine kindness. Stylish layout througout, and comfortable beddings were great. This hotel seems to fit better for the business travelers. Glad mapo made our stay in koreal so happy and great. We were astounded by the grand and nice view of it. Staffs were so helpful and professional. They converse well in english. Rooms are definitely high class and clean. We have to give 5 star review! Location of this hotel was great, with lots of different amenities provided within the hotel room. Because it's new, it is still pretty well-maintained, even though they don't really stock up on items used during our stay. Nonetheless, still worth a stay. This is my second time to visit GLAD. There was sth. bad happened during my reservation in my previous visit but I was appreciated with the room. So I decided to come again. This time, everything was amazing. Staffs were nice and helpful. The room was clean and the view was great. I would probably choose GLAD for my next visit to Seoul. Stayed there for 5 nights. Pros: - Super comfortable bed. - Light and sound proofing are good. - Good sized rooms. Big bathroom, wardrobes - Even coming with Iron and Ironing board! - Individually control A/C. Room temperature response exactly to the temperature set Cons - Cups are way too small. How much do cups cost? - Sockets at the table are poorly designed. Not easily accessible. - Water will almost certainly flow out and wet the floor while showering. Bathroom is so big, why not create a seperate shower area? This hotel is brand new in an amazing location. It's right next to one of Seoul's main subway lines. As you exit the subway, the hotel is right in front of you. Literally right in front. You don't even need to cross the street to get to it. The room is well designed and very modern. The staff are also very friendly. If you want a late night snack, there is even a self-contained 7-eleven inside the hotel lobby. I've been to lots of different hotels for work and holiday and this is probably the best one I've stayed at for this price point. I would definitely stay here again. Definitely one of the best hotels I’ve stayed in Korea. We stayed here for a week and it was very pleasant and convenient. It is right in front of Gongdeok station exit 9. There’s also a 7-eleven at the hotel lobby and an e-mart near the hotel. The room is very spacious and clean. There’s even a tub in the bathroom. I definitely recommend this hotel. Would love to stay here again! 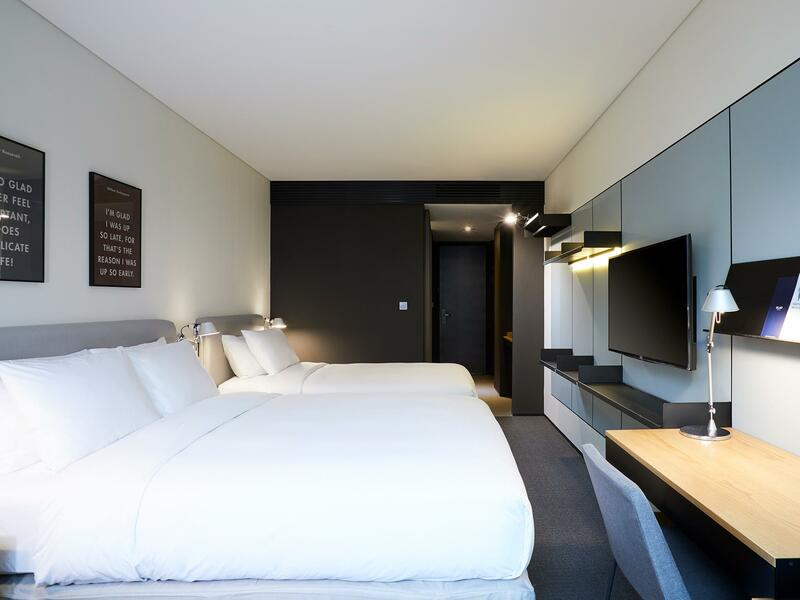 The hotel is at superb location, right at Exit 9 of Airport Line of Gongdeok. Maybe it is still new, the price and facilities are excellent. The only downside is that no toothbrush set (including toothpaste) is provided. The insufficient lighting makes the eyes a bit tired. Despite of these, everything is perfect. I would definitely return.